Nine (I counted) flowers open at once on this Hibiscus moscheutos 'Luna' (rose mallow). That's the most flowers I've ever seen in one day on this plant! 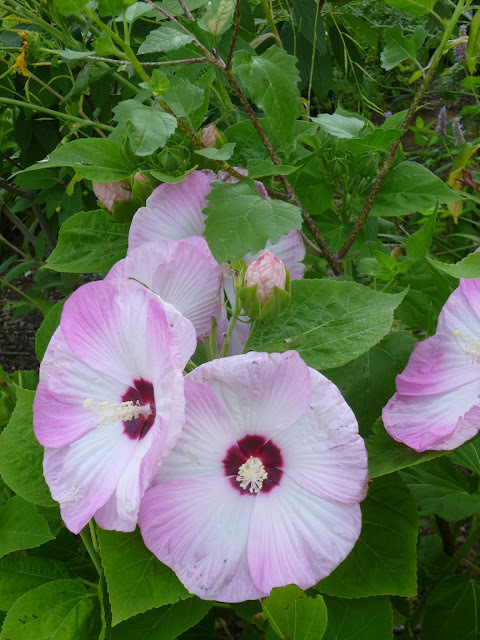 After much anticipation, I looked out the window this morning and saw the rose mallow (Hibiscus moscheutos) covered in giant flowers! I believe this is the 'Luna Pink Swirl' cultivar that has been named a Louisiana Super Plant. And if it can thrive in the heat and humidity and rain storms of Louisiana, that bodes well for its ability to shine in Tennessee too. I think I've had this plant for 3 or 4 years now and it seems to get a bit bigger and better each year. The first couple of years, the foliage and the buds were attacked by hibiscus sawfly, but fortunately (knock on drywall) that seems to have been less of a problem the last couple of years. Perhaps the garden is in balance to the point where something beneficial is keep the hibiscus sawfly in check? 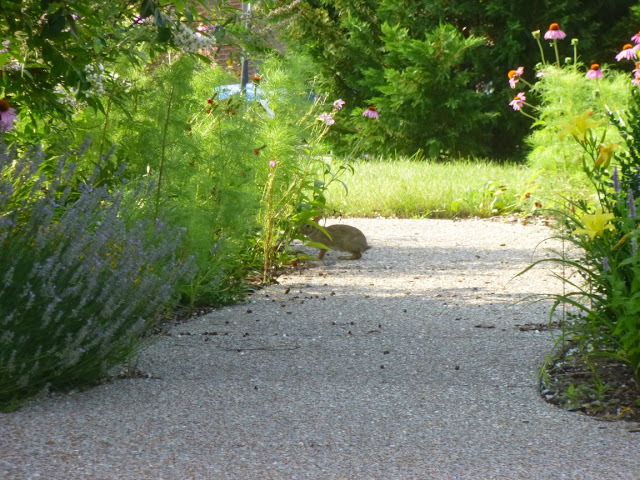 Also, interestingly, whereas something (perhaps the bunny below or maybe a deer?) 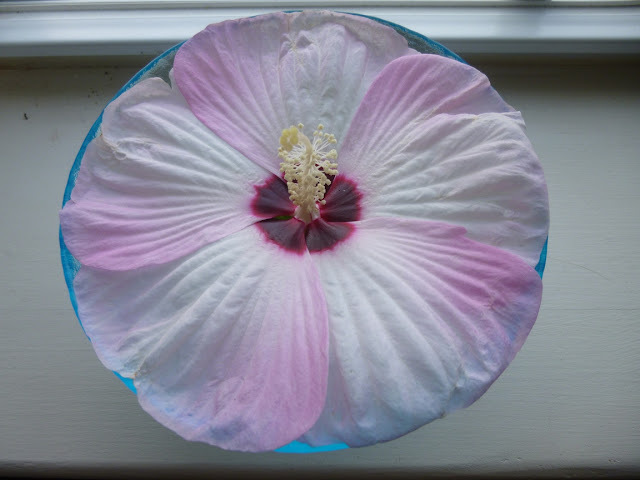 devoured all the foliage on the Hibiscus coccineus (scarlet rosemallow) that I tried planting this year, the rose mallow has suffered very little nibbling. 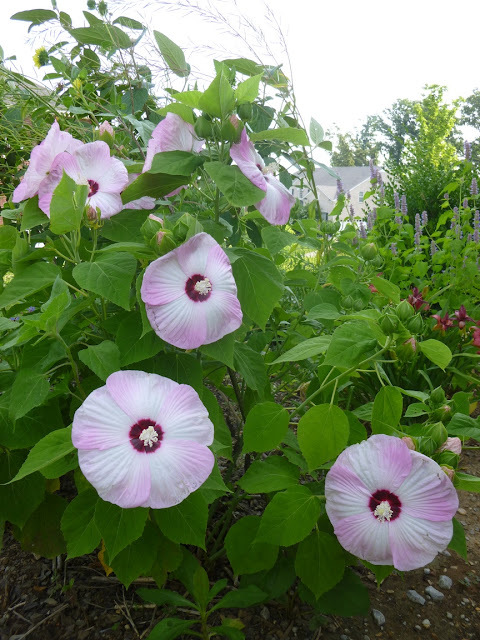 According to BONAP, Hibiscus moscheutos is native throughout the Southeast, Mid-Atlantic and much of New England and the Midwest. Despite being a native plant with large, prominent flowers, I don't see it attract many (any) pollinators. Maybe other cultivars are better at attracting beneficials? It is very well-behaved in the garden. It has never self-sowed in my garden and shows no inclination to spread. About the only negative thing I can say about the plant is that it is late to emerge in the spring. But have patience, and you will be rewarded with gorgeous, plate-size, dramatic flowers. In the garden, these flowers tend to last for just a day (or part of a day) before being replaced the next with new flowers. As a cut flower, I think it typically looks good for at least a few days in a bowl of water. (Update - I was wrong. It still only stays fresh for about a day or two at most as a cut flower.) Makes a nice centerpiece, don't you think? PS - When a flower blooms in the garden, does anyone notice? You'll be among the first to know if you subscribe to Garden of Aaron via email!